There are a lot of statistics, articles, webinars, and case studies that show how important personalization is for online businesses. That’s why I don’t want to waste your time discussing it. Instead, I want to talk about an issue that’s been discussed in marketing circles for a long time, and unfortunately, hasn’t been fully resolved–customer privacy. In my work with clients, I always think about how we can grow their business, get more information about their customers, and learn about customer purchase behavior so we can make the online experience more personal and attractive. Recently, I came across a personalization survey conducted by Accenture. The results were eye opening. As we can see, we have our work cut out for us as marketers when it comes to getting shoppers to share their personal information. So, what steps can online retailers and e-marketers take to put consumers at ease and make them more willing to share their personal information? But, what exactly do they mean when they say communicate clearly or find a more natural way of asking questions? How does doing all three of these things impact the shopping experience in the real world? To answer this question, I did some research. The goal of my research was to find out if there are online retailers that practice clear, transparent communication and to share the best examples with you. How do they collect personal information? How effectively do they communicate where the personal information will be used? How well-crafted is the personalized message? I reviewed websites of more than 100 online clothing retailers. Such big sharks like Nordstrom, Macy’s, and Neiman Marcus were excluded to focus on less known, but still popular clothing retailers. Also, note, the research doesn’t include personalization created by platforms or software such as BloomReach, Optimizely, Blueshift, etc. – personalization tools that help marketers to gather customer information without them knowing about it. My research involved not only general website overview and pop-up analysis, but also registration, account creation, and other actions a regular shopper might take in a typical shopping experience. So, let’s get to the most interesting part – my findings! It was rare to find a clear explanation on how the retailer would use the requested personal information or how it would benefit the customer to share it. It was equally rare to find questions that showed that the retailer cared about the customer and wanted to make the online experience pleasant and memorable. The examples I will discuss not only stood out, but made me want to come back and start following them, not as a marketer, but as a consumer. It becomes obvious, to win over frustrated or indecisive shoppers, we must quickly connect them with the very best resource to help them find – and buy – exactly what they need. The question is, how do we do it? For this example, let’s pretend I’m one of those customers that knows that she needs a new bra, but hasn’t decided what kind. The challenge is that choosing the right bra is not easy. Even being at the store, touching the product, and trying it on in multiple styles can be a real headache. However, it’s not a problem for online bra retailer True&Co. They’ve solved the bra shopping dilemma for consumers with a quiz that helps to find the right bra. True&Co takes a different approach. They know the main problem – 64 percent of women are wearing the wrong size bra. Thus, to make customers comfortable and to hold their hand through the whole browsing and shopping experience, they let customer know that they are there to help. There are a lot of points. However, all of them address the main shopper’s concerns. Phrase length, the font, and new paragraphs help the message stay short and straight to the point. Right when you start the quiz, there is an explanation on how the provided information will be used and how it will benefit the customer. So now there are no assumptions, there is a firm confirmation. I was impressed by the questions, visualizations, and additional information that made the whole experience very interactive. Going through all the questions, I learned more not only about myself, but also got tips and recommendations on how to take care of a bra and what to consider when buying it. Not even a sales person is as informative as this quiz was. And the end result, as expected, was a list of bras that, based on the quiz, would fit the best. Uses a unique approach to get personal information through a questionnaire that not only helps shoppers find the best bra, but also educates them about the product. Communicates clearly how the provided information will be used. Asks questions that are well thought out with the option to not answer, which gives the customer control of the personal information. What is the result of this careful attention to personalization? In the two years since the quiz was launched, True&Co has generated $22 million in revenue. Very impressive. In 2017, there will be 4.9 billion email users. That number is expected to increase to 5.5 billion by the end of 2019, according to a report by tech market research firm, The Radicati Group. With numbers like that, it makes a lot of sense to continuously increase the number of email contacts. A growing email list can help attract new customers, promote the business, build relationships, and most importantly increase sales. The challenge here is how to do it right. 80% of reviewed websites had a subscription pop-up right at the beginning of the browsing. The Outnet approach, when it comes to getting new subscribers, is more nurturing. What do they do differently? The luxury clothing retailer concentrates on its value proposition first. When you enter the website, you see big names, big brands, and great discounts. The message is clear – luxury designer clothes with more than 60% off. Everyone loves it. They don’t push you to become a subscriber right away. They “give you an option” to become a subscriber when you are ready. What is interesting, if you understand design and value luxury clothes, seeing the designer clothes and their price, makes you desperate to become their subscriber. That’s what happened to me while browsing The Outnet landing pages. The link to become their subscriber is at the bottom of the page. Is that placement a good approach? It’s difficult to say, it needs testing. However, it’s different compared to other online retailers, and customers who care about their privacy really appreciate it. Let’s take a look at what personal information they gather and how they communicate where and how this information will be used. In order to become a subscriber it’s not enough just to provide an email address. The Outnet wants shoppers to create an account. The form starts from a short, but very clear emphasis on the benefits of becoming a subscriber. The personal information they gather consists of the shopper’s name, email, password, and country. Short and sweet. The form ends with an example of their newsletter, which I think is awesome – expectations upfront. The subscription form doesn’t have a lot of personalization, it’s more of a form to get the shopper’s personal information. However, the summary that is shown when the account is created clearly shows and confirms why it’s a good decision to become a subscriber. Every mentioned point speaks to the shoppers’ needs. “We decided from the start we were not going to be a flash sale site, but instead offer our customers an experience she has never come across before,” says Andres Sosa, executive vice president sales, marketing and creative at The Outnet. Mr. Sosa in his interview with Luxury Daily newsletter also shared that 5 percent of The Outnet’s consumer base generates 41 percent of its revenue and the reason for that is the personalization and brand voice, which speaks directly to its consumer. I guess their different approach works. So what determines a good customer service experience? How quickly you respond to a shopper’s request? How well you resolve the problem? What about an efficient new customer onboarding process? 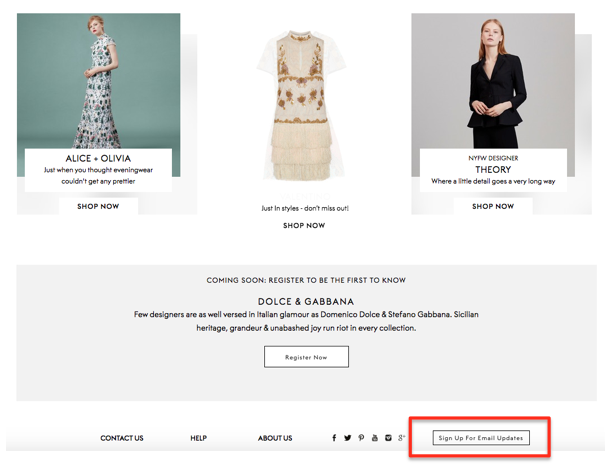 The Gilt, a designer clothes online retailer, did a great job creating a very user-friendly and organized account structure that makes onboarding easy, interactive, and very personalized. Let’s take a look at what I mean. After a shopper enters his/her email, password, and gender, he/she enters a different world, which is fun and focused mainly on the shopper interest. On the left side of the account screen, there are different categories that the shopper can go in and fill out. The category list starts from the most important thing – profile creation, which is divided into two parts: brands and sizes. Shopper needs and interests go first. It’s important to note, despite the fact that the shopper has already created an account, they still briefly explain why information about their favorite brands, size, and location is important, how it will benefit the shopper. Each section is very detailed and it makes sense, as it helps to create a very relevant, personalized message. Answering questions about the size and style, you get a feeling that it might be one stop for all your shopping needs, which is great, as it can save a lot of time in the future. The purpose of creating the account is clear. The shopper is in control of what information to provide. Everything depends on whether the shopper wants to receive personalization or not. “Members are actively engaged with Gilt: 77 percent visit 10 or more times a month; and 94 percent tell friends and family about Gilt. When we create a positive experience, it not only creates loyalty among our existing customer base, but it ensures that our customer base is going to grow, because our customers are our biggest advocates and evangelists,” says Tamara Gruzbarg, Senior Director of Analytics and Research at The Gilt. What goes wrong? Why is the rate so high? Out of curiosity, I visited 10 websites – provided my personal information, added a couple items to the cart and left. Guess what? I received only one email that reminded me about my cart. I didn’t want to discuss the same online retailer in this blog post, but this experiment left me no other option. The follow-up email was sent by The Outnet. Now, does the oversight by the other 9 retailers fully answer the question why the cart abandonment rate is so high? No, but it becomes obvious that the major problem is not about how well those retailers are crafting their abandoned cart communications, but the failure to send a follow-up email at all. But, that is a topic for another blog post. The follow-up message from The Outnet was personalized from the headline to the message content. It spoke directly to me. I didn’t even need to open the message, because based on the email subject line, I already knew what it was about. The message is short, nothing fancy, but is very relevant. What do they do right? And finally, they play on my emotions by mentioning that “things sell out fast at THE OUNTNET.COM” and if I want these glasses, I need to hurry up. Yes, they used my email, but that’s because I provided it, it’s not something that came out of nowhere. My research shows that it’s possible to get shoppers’ personal information without crossing a line of privacy. Having a strong value proposition, clear/transparent communication, and a natural way of presenting and asking questions isn’t a personalization myth. The key here is putting the customer perspective first and only then building a strong personalization strategy around it. I’m very curious, what personalization tactics do you use? Share your experience and success stories!